Lansing, MI – Decades before instant replays and digital sports on demand, radio announcers brought baseball to life. But sometimes, they themselves never actually saw the games. When live on-scene broadcasts weren't possible, telegraph operators would relay the action from the ballpark to a studio. There, announcers would re-create the game from ticker tape reports and homemade sound effects. Today, game re-creation is all but a lost art. But for the Lansing Lugnuts' play by play man, it's an annual tradition. Jesse Goldberg-Strassler is a young voice carrying forth an old heritage. As the voice of the Lugnuts, he relays the heroics and the heartbreaks of Lansing's minor league ball club. Goldberg-Strassler does what countless predecessors have done for nine decades...convert the national pastime into theater of the mind. "You are the eyes for any fan who's tuning into the game, and so you need to earn their trust and let them know here's what's going on in the game," says Goldberg-Strassler. 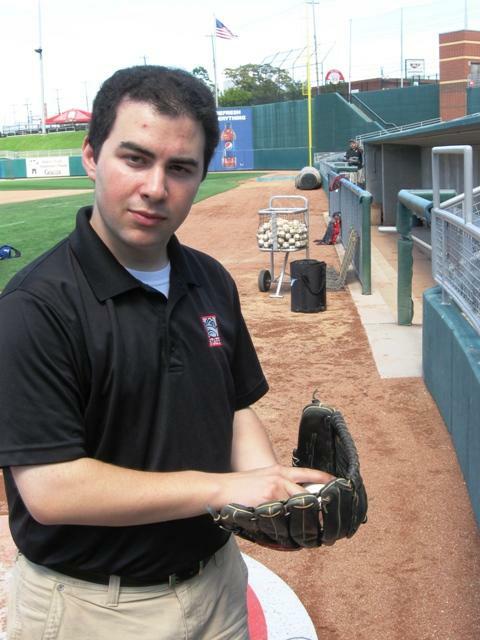 But when Lansing hosts the Dayton Dragons next Tuesday, Goldberg-Strassler's eyes won't be on the field. Instead, he'll forego his prime perch above home plate at Cooley Law School Stadium and call the game from a windowless hallway. As they say in a whole different sport..."this ain't his first rodeo." Back in 2005, as an intern with the Brockton, Massachusetts Rox, the team's president gave Goldberg-Strassler a challenge: call the game like they did in the old days. "This is how broadcasters used to do it in the 1930s, 40s and 50s," he recalls. "Best of luck. And so we did it and it was disastrous. But it was fun." Three years later, while working for the Windy City Thunderbolts, fate - and real thunderbolts - gave him another shot. "This enormous thunderstorm had gone through the Chicago area, and it knocked out all the Internet in the press box," Goldberg-Strassler explains. And so we had to call it from a place where we had Internet which was the front office for the stadium. We grabbed two mini-bats from the souvenir shop, we grabbed a baseball glove and a baseball...and we set about re-creating it just out of pure necessity." Fate had one more surprise. Not only did the Thunderbolts electrify the crowd with an 11-0 shutout...their pitcher also threw the first no-hitter in franchise history. "And so I got to call my very first and so far my only no-hitter...and I've never, ever seen one," he laments. (Goldberg-Strassler announcing): "(Tyler) Powell kicks, throws...there's a swing and a high fly hit towards centerfield...back it goes....(Jake) Marisnick tracking it back, but he has room. And he makes the catch just shy of the warning track. Something like that (laughs). There's a rhythm to this ritual. Though blind to the action, Goldberg-Strassler still has to vary his pitch as much as the man on the mound. Baseball is a game of timing and patience...and never more so than during a re-creation. "Generally, as the game goes on, you find yourself a batter behind, then three batters behind," Goldberg-Strassler notes. "Before you know it, you're a full inning behind, but that's the proper way for it to be. Otherwise if there's any kind of delay, you're in trouble." Larger figures than he have faced that trouble. Once in 1934, the sports wire machine broke in the ninth inning of a Cardinals-Cubs game. Twenty-three-year-old sportscaster Ronald Reagan found himself hilariously improvising for nearly seven minutes. And that's where the announce becomes the art. When the crowd is going crazy over the home run, Goldberg-Strassler is way behind real time, calmly taking care of unfinished business. "You can't get excited before the pitch," says Goldberg-Strassler. "Your emotion rises, you call it as naturally as you possibly can. And that's where I think it really helps to have so many games of broadcasting underneath your belt. You can draw upon that, and it becomes nearly muscle memory." Jesse Goldberg-Strassler has had some time to hone his skills since that fateful day in Illinois three years ago. But just like that no-hitter, every game carries the potential of legendary plays...plays the Lugnuts' announcer could very well miss with his own eyes. "If something miraculous happens; if a guy hits 10 home runs...oh boy, will I rue not being able to see it," he says. "But still, I'll have a part in it."